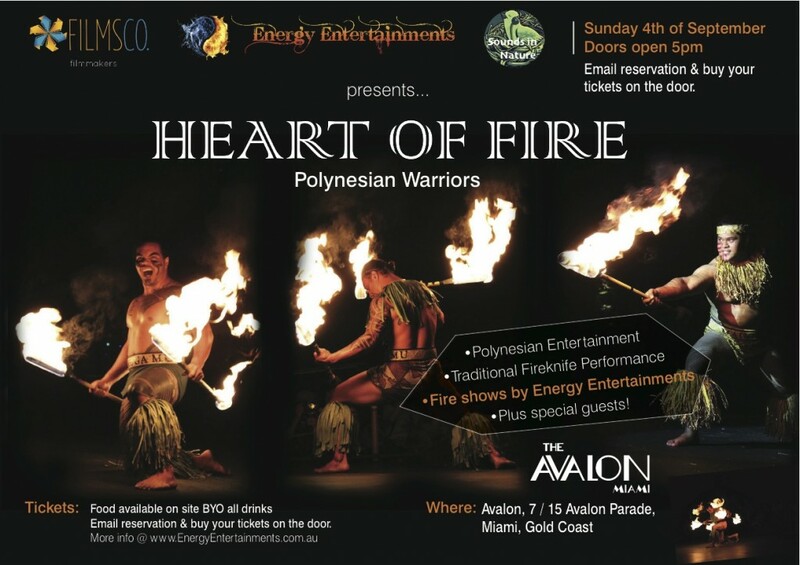 HEART OF FIRE – Polynesian Warriors. Next Event Screening held at The Avalon Miami, Gold Coast on the 4th of September. Tickets $15 on the door, email to guarantee entry, link to Facebook Event Page – Heart of Fire Event @ The Avalon, Miami. Join us for our next ‘Heart of Fire’ documentary screening, we have some great entertainment install for the evening! Food available on the night by Hangi CHEF (Vegetarian option available) Food will need to be pre ordered so please message to book your food. Its a big dish that’s super tasty $20. BYO all drinks and chairs. Families welcome, $15 on the door for Adults and $5 for the kids over 10 Years Old. Spaces are limited so please email energyentertainments.au@gmail.com to reserve your space. We promise its going to be a fun night! It’s Fathers day so bring them along to join in the fun. See you all there at 7 / 15 Avalon Parade, Miami, Gold Coast. Fire | Film | Music – The Heart of Fire team have created a documentary into the Heart of Fire dancing warriors within the Polynesian culture. Along with the screening of the documentary the event will see a mix of traditional Polynesian fireknife dancers, Polynesian musicians, traditional greetings and songs, funky blues music by Matty Rogers and smooth island tunes by Favourite Son. Energy Entertainments will also be performing a huge fire show for the event. We have added the event to various sites so lets hope the venue is pumping! The weekend Edition | Visit Gold Coast | Queensland.com | Miami Gold Coast | MyGC | More Gold Coast | Energy Entertainments Facbook Page | Lets have some fun!